I am writing in response to the disturbing and utterly insensitive political cartoon that appeared in the Sunday,October 4 issue. The cartoon showed a weather man standing in front of a weather map. The U.S. map showed random smiley sunshine faces, and machine guns appeared in the regions of the recent mass shootings. The caption was truly unthinkable: a reference to the weather being mostly sunny with a chance of mass shootings. As a veteran journalism and English teacher, and a freelance journalist, I am completely blown away that any journalist would be heartless enough to treat this grave matter with sheer flippancy. After 9/11, one political cartoonist captured an image of the Statue of Liberty with a tear in her eye. This noted piece was reflective of America’s sadness, America’s despair. This was an image that spoke for the heartbroken millions. This cartoon proved that there is a time and a place for sarcasm; during a time of devastation, we need only compassion. As the country hears of these devastating mass shootings, no one is smiling. The smiling sunshine faces from Sunday’s cartoon should, at the very least, not be grinning. They should be weeping for these innocent lives that have been taken away. 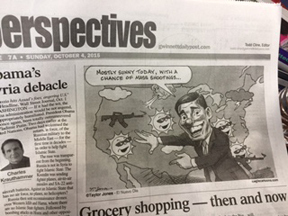 I am gravely disappointed in the editor’s decision to run this cartoon. It is untimely, insensitive, and shows a complete lack of humanity.